From Meredith to Mommy: The Toys are Multiplying! This was one of my VERY FIRST POSTS - and probably the first where I wasn't just giving a rundown of an event or day. I have probably tried about fifteen new strategies for toy containment in the living areas, but it's a losing battle. And with Madison's birthday next week - I'm ready for another big blow. For the next few years, our main floor will be overtaken and there will be no mistake that two small children live in this house. Last night, Adam and I decided that we no longer need the Pack and Play open in the living room. Reagan hasn't slept there in a few months, I stopped changing her there about a month ago when she got too wiggly, and it was becoming a bit of a dumping ground for two sizes of diapers, blankets we don't currently use or need, wipes I need to keep moving as Madison gets more inventive about how to reach inside, pacifiers, etc, etc. So I cleaned it out, we collapsed it, moved the attachments to the attic, and the rest to Reagan's closet. As we did this, we talked about how nice it would be to get our living room "back". 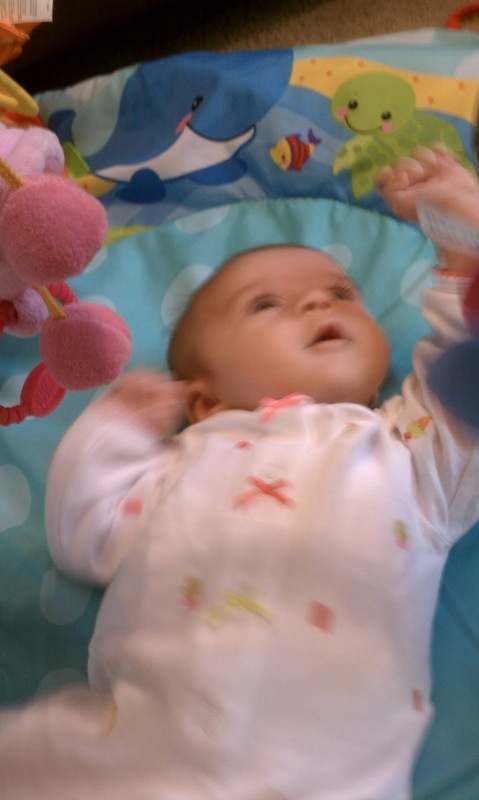 One playmat in bright aqua, with three crisscrossing bars with toys danging from them. One mini trampoline, 40 inches in diameter, with a handlebar to grab when jumping. One "travel" swing (admittedly smaller than most "full size" baby swings I've seen, but not "small" or what a normal person would consider "traveling" with by any means). One aqua bouncer that is almost completely flat because of multiple toddlers climbing into it and bouncing themselves. This was very useful when Reagan was about a month old, but now that she wants to actually see the world or play in it, is completely useless. Three hot pink bags and one hot pink wagon of megablocks. Ok, those are against a wall. But unlike the kitchen, they don't so much blend in with the decor. One Mickey Mouse ride on fire engine. So somehow, the removal of the Pack and Play didn't seem to make a difference in that room. Go figure. 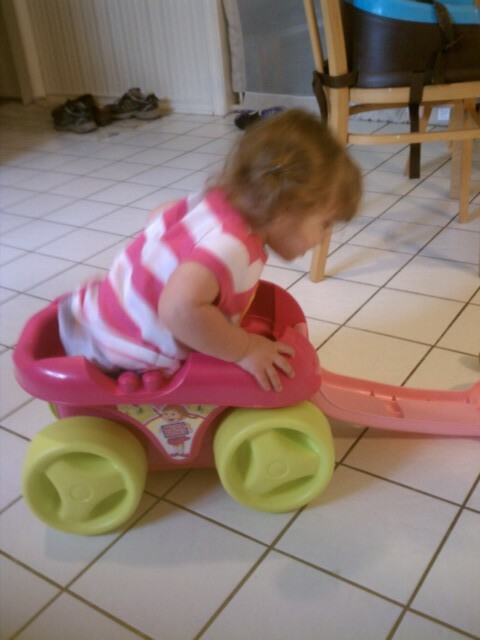 It coincided nicely with the arrival of the exersaucer and trampoline. Well ok, the family room is better. Except for the giant play yard baby gate that stretches across the corner of the room that houses the TV and fireplace. And the Winnie the Pooh armchair. And the potty (yes, the potty). And the model Mickey Mouse Clubhouse (originally planned to be in the living room. But after the two year old tried to move it by herself every morning, which resulted in pieces coming off and needing reassembly EVERY time, we gave up and leave it out). And instead of keeping magazines and our wedding album under the coffee table, we now keep a box of crayons and coloring books and several potty training stories. There are no longer any candles/picture frames/decorative things on the tables. We used to have a candy bowl. I kind of laugh at that now. The kitchen is normal I guess. A high chair and a booster so it's pretty obvious we have small children, but our high chair attaches to a regular kitchen chair, so we all sit at the table together and there isn't a giant stand alone high chair. Our counters get cluttered, and some of that is the girls' stuff, but none of it actually BELONGS there, so I don't count that. The pantry and cupboards are semi-clogged with baby and toddler food, but again, you don't see that. The dining room is baby gated off. 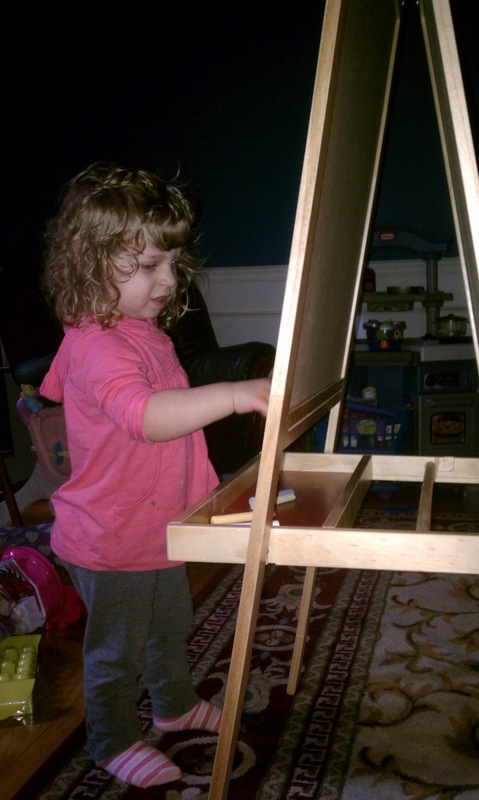 A china cabinet, wine rack, and humidor aren't exactly toddler friendly. It looked really nice for a long time because it was hard to "mess up" since it wasn't easily accessible. Ok, for a while we made sure to put bags, purses, briefcases, etc in the dining room and suggested guests do the same to avoid having their bags emptied and reclaimed. But that wasn't really a mess, and anyway, they'd be hard pressed to do that now. Because I got my wannabe-overachieving-hey-I'm-a-creative-stay-at-home-mom-who-does-fun-projects-and-doesn't-need-expensive-toys-to-learn-just-lots-of-play bug. Which seems to require a lot of STUFF. I have the stuff VERY neatly organized. 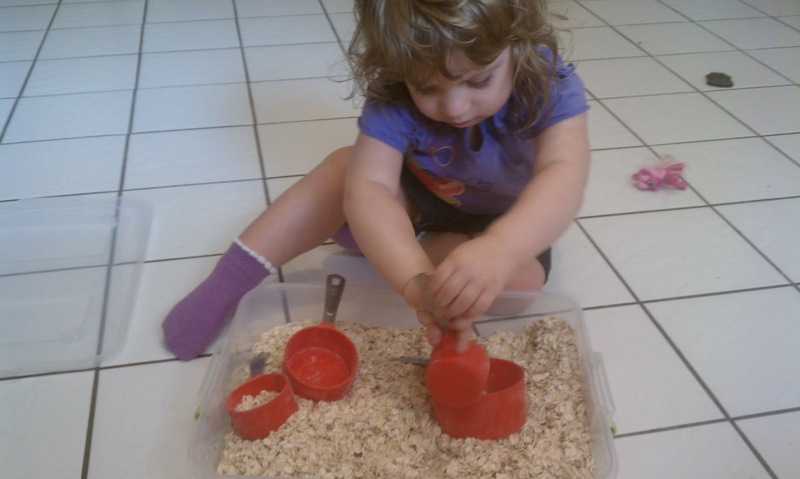 Three sensory boxes (oatmeal, fish tank gravel and rainbow rice), a container of moon sand, beans and a tablecloth, and several clear storage boxes with craft supplies. And another crate for play doh and all the accessories that go with those. It's neatly organized, I promise. But somehow a pile of storage bins and boxes, however neatly stacked, still doesn't scream "dining room". Where am I going with this? It's time to truly ACCEPT that this is our house right now, and that's not a bad thing. It says we have two really lucky little girls living here who have fun all day long. Honestly, it only bugs me when a) I miss a day of picking up and have to wade through everything to get it back in semi-order, b) we entertain....(hold on, I'm laughing. We either entertain our parents or people with small children whose houses look the same) or c) I read a magazine or look at pinterest and feel like I should be able to have child-friendly-accessible-creative-playful-organized-neat-and-yet-adult space (to go with my bug that I mentioned above). Someday my house will be uncluttered and adult again. But that will mean my girls are grown up. And I'd rather enjoy the takeover for as long as it lasts.